The second half of the 20th century saw the emergence of independence movements in Africa, agrarian reforms in Latin America and the green revolution in India. Yet, the unresolved issue of land ownership means that the rural poor, who depend on agriculture for their livelihoods, still face an uphill struggle to take control of their own future. Back in the 1990s, a number of countries began to negotiate and sell the rights to use parts of their sub-soil and land to private foreign investors and multinationals, with many of them enjoying government backing for these deals. Since mid-2007, this trend would take a new twist. In a tense social climate, an increasing number of foreign investors has acquired vast swathes of agricultural land in Africa, Latin America, as well as Central and Southeast Asia. At the same time many countries throughout the world have seen their food security threatened due to the shrinking availability of certain agricultural products and the price hikes that ensued. The globalised effects of local factors are blamed, such as failed harvests, rising percentage of land used to produce biofuels as well as speculation on the agricultural commodity market. Although the media and the research community have shown a great deal of interest in this large-scale land acquisition, little is still known about its impact and data on the phenomenon are scarce. development agencies have the capacity to create the necessary space where all stakeholders can express their needs and where these can be satisfied insofar as they are in keeping with the principle of sustainable development. The IISD study focuses primarily on the legal provisions in place in recipient countries and on the legislation which governs access to natural resources. As already noted in the previous study, the legal framework in these countries tends to be insufficient, leading to a situation where international law, which provides hard rights for foreign investors, takes precedence over domestic legislation. The social impact of large-scale land acquisition by foreign investors is then a source of concern. The authors of this study also attempt to provide answers to seven fundamental questions, such as “What happens if land or water rights are expropriated or redistributed, especially if there is a food or water shortage?”. In this instance, given that all international investment agreements impose a requirement for compensation to be paid if investor rights are expropriated this international obligation for compensation would apply not only to the land but also to business operations. Consequently, the recipient country may find itself in a Catch-22 situation. Finally, the study gives several examples of agricultural land contracts in the annex. 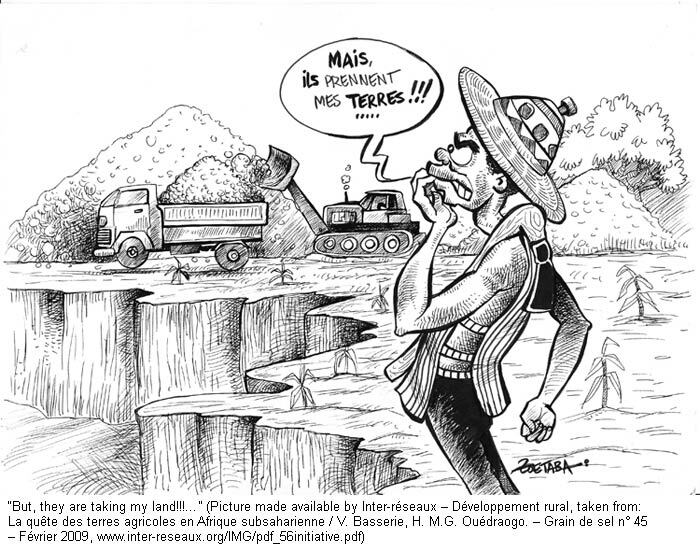 Even a cursory glance shows that there is an urgent need for recipient countries to define and tighten their legal framework if they are to avoid being despoiled of their valuable natural resources. Global and national population growth is mentioned less frequently in relation to climate change than other topics. Yet it is just as relevant. More people living on the planet means that we will run short of resources more rapidly. It also means an increase in greenhouse gas emissions, in the incidence of conflicts over resources, in poverty, and in migration. What are governments doing to address this development? Not much. Developing countries, keen on stimulating economic growth, are hardly motivated to make binding commitments regarding carbon dioxide emissions. They rely on their large populations to advertise low per capita emission rates. Most developed countries are not interested in birth control either, since a decrease in population can have a negative impact on national power and productivity. Overall, these suggestions remain too general and do the complexity of the issue little justice. Nonetheless, with its wealthy bibliography for further reading, this publication provides good food for thought for decision-makers. Scientific studies clearly show that the consequences of climate change will be fatal for humanity unless we immediately take efficient measures. Yet there remains a large gap between scientific analysis and political implementation. Two recent overviews intend to narrow this gap and raise awareness among the broad public. A paper by the Worldwatch Institute explicitly addresses laypeople. On few pages it highlights causes, characteristics and impacts of climate change, followed by a list of milestones of international climate negotiations and a glossary of the most important specialised terms. The paper by UNEP goes into more detail and is directed at political decision-makers, among others. In a language understandable for non-specialists it summarises the most significant contents of the most recent report by the Intergovernmental Panel on Climate Change (IPCC). Past and future impacts of climate change in the different regions of the world are an important issue addressed. Moreover, the paper discusses different future scenarios and presents numerous options for reducing greenhouse gas emissions. Belize’s coastal resources are extremely valuable. 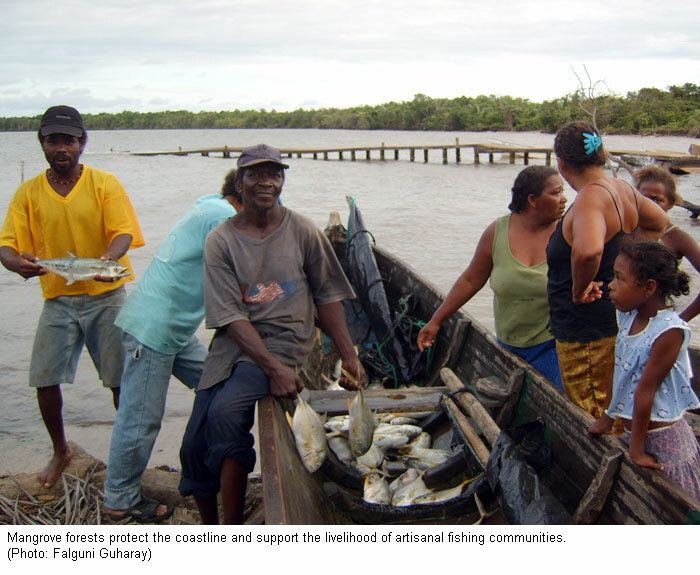 The coral reefs and mangrove-lined coasts provide critical protection against erosion and wave-induced damage from tropical storms; they support artisanal fishing communities and lie at the heart of a vibrant tourism industry. In 2007, tourism associated with coral reefs and mangroves generated around US$190 million, economic benefits from fisheries relying on reefs and mangroves was around US$ 15 million, and the value of protection of coastal properties by these ecosystems was estimated to be nearly US$ 300 million. These figures relate to only three of the many services provided by coral reefs and mangroves and thus represent only a lower-bound estimate of their total economic contribution. In spite of their significant economic contribution, protection of these coastal resources is overlooked by coastal development policies and investments. A study carried out by the World Resources Institute (WRI) warns that the steady decline of reefs and mangroves in Belize may cause fish populations to drastically diminish. Coastal properties will become increasingly vulnerable to storms and erosion, and reef-related tourism will suffer. The study recommends committing additional resources to a permanent fund for Marine Protected Area (MPA) management, improving collection of data on basic indicators of human use, and installing measures to capture missing revenues from visitors to the protected areas. Ecosystem degradation and natural disasters are frequently the reasons why people migrate to other regions or countries – in the long term, for a short time, or seasonally. The resulting migration flow will increase considerably in the coming decades and could have devastating consequences for the economy as well as for social and political stability. The issue at hand is not situated locally, but represents a global process, the outcomes of which depend to a large extent on the capacity of the various countries to adapt to climate change. Poor population segments should be given other alternatives for securing their livelihoods than leaving their homeland. Efficient policies are urgently needed. The authors of this publication intend to deepen the understanding of the interlinkages between climate change and migration and thus stimulate new ideas and approaches. To this end, they provide decision-makers with useful information in the form of maps, climate-relevant trends, and patterns of population distribution. Case studies from Asia, Central America and Africa illustrate the regional dynamics of climate change and human mobility. Traditional knowledge (TK) – knowledge from times long gone? Not at all. 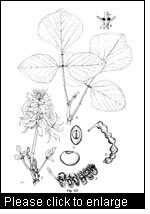 Traditional societies have handed down their knowledge and practices relating to wild plants and crops from generation to generation into modernity. Its topicality also shows in the fact that the world benefits substantially from what remains of it. Many drugs on the international markets, traditional medicine and crops with specific characteristics are proof of this. Despite internationally binding agreements on the protection of intellectual property there are many loopholes when it comes to practical application of the law. These loopholes disregard the fact that the knowledge of indigenous communities, for example, is clearly socially and geographically rooted and therefore belongs to the intellectual property of these communities. Scientific, pharmaceutical and agribusiness corporations continue to profit from the knowledge of these communities without compensating them. In its newly published brochure entitled Intellectual Property and Traditional Knowledge, the World Intellectual Property Organization (WIPO) for the first time presents a wide range of concepts against misuse of TK that have been carefully tested in practice. WIPO emphasises that TK is a key factor for local sustainable development. The brochure presents numerous examples from traditional communities that demonstrate how existing legal concepts for the protection of TK can be adapted to different situations. The ongoing economic crisis will slow Africa’s economic growth considerably, mainly due to reduced demand for commodities and food in industrialised nations. In addition, direct investments and other cash inflow from abroad are decreasing. The authors of this report demand that the crisis is countered by means of agricultural reforms, among other things. Actual production is to be increasingly complemented and linked with upstream and downstream sectors, such as production of agricultural inputs or processing of foods. At the same time, African countries should engage more in regional cooperation, thereby generating regionally integrated value chains. Unlike in the Asian green revolution, these should concentrate on a wide range of products that are strategically significant for Africa itself. Such products include rice, legumes, maize, cotton, palm oil, meat, milk, and fish. This strategy could help reduce problematic dependencies on a small number of unprocessed export products. At the same time it could boost economic development and create new employment opportunities. Only marginally the authors point out the danger of small-scale farmers remaining excluded from such value chains. It is important that this, as well as environmental concerns, are not neglected in economic development strategies. Woody plants (trees, shrubs, bushes and lianas) typically grow in natural forests, as well as on plantations and cultivated land. Written in the aftermath of the conflict which beset Rwanda in 1994, the original aim of this book was to safeguard the immense scientific and traditional knowledge of the country’s woody species for future generations. 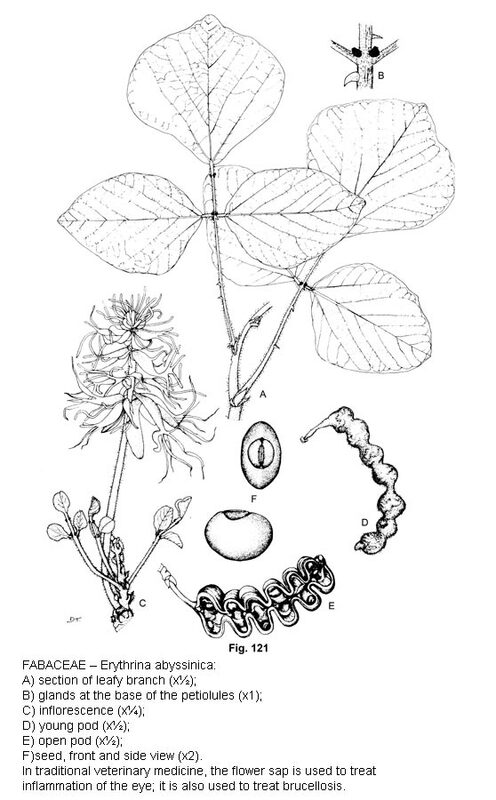 The botanical descriptions in the book are inspired by Georges Troupin’s beautifully and meticulously illustrated work “La Flore des plantes ligneuses du Rwanda” (1982). The authors document not only the ecological characteristics of the woody plants found in Rwanda but also the wealth of traditional knowledge with regard to their different uses. The book contains extensive practical information, such as their exact location, their phenology, silviculture and the quality of the wood that they provide. Their uses as a source of food, as well as in traditional medicine and rituals are set out in minute detail. In addition, a coloured vegetation map of the country shows the distribution range of every species. This book constitutes an excellent reference manual for forestry and agroforestry professionals. Furthermore, the approach which led to its publication could also be adopted by other similar projects. It would only be fair to assume that this study, with its encyclopaedic reach and accompanying online discussion forum, has achieved the objectives that it originally set out to attain. Source: Les plantes ligneuses du Rwanda : Flore, écologie et usages. U. Bloesch, G. Troupin, N. Derungs. Shaker Verlag, 2009. 757 p.
The United Nations Economic Commission for Latin America and the Caribbean (ECLAC) summarised valuable information about the region’s economies in a document that was handed out to the heads of state at the Fifth Summit of the Americas in April 2009. According to the estimates presented in this document, after six years of positive growth, economic growth in Latin America and the Caribbean in 2009 will be negative at around –0,3% (GDP growth). Unemployment rates in the region will rise sharply, resulting in increased poverty. The countries most severely affected will be Mexico (–2,0%), Brazil (–1,0%), Costa Rica (–0,5%) and Paraguay (–0,5%). Meanwhile Panama, Peru, Cuba and Bolivia are expected to maintain a growth rate of around 3%, and Chile and Ecuador will not experience any change in GDP in 2009. The negative effects will become evident in terms of a slowdown in international commerce and a drop in the prices of primary products, resulting in a 15% reduction of income from international trade. Export rates will see a sharp drop, affecting mainly the more open economies of Mexico and Central America. There will be a reduction in remittances and losses in income from tourism, especially in the Caribbean and Central America. These impacts will occur in a context of growing uncertainty at the regional and global level which will affect the confidence of investors and the private sector, resulting in reduced investment and consumption. Can we draw comparisons between “fast-wood” and “fast-food”? The answer to this question in certain cases is yes, as the replacement of indigenous vegetation cover in some countries with monocultural fast-growing forest plantations to satisfy surging demand for wood products is as damaging to the health of forests as fast food can be for human health. This world atlas of forest distribution explores this issue in detail. Over the last two years, climate change and deforestation have climbed to the top of the environmental agenda. The present publication begins by looking at what defines a forest before demonstrating their role and importance from a variety of perspectives, including biodiversity, livelihoods, conflicts, forest products, fauna and certification. The many illustrated examples and maps which compare changes in forest cover over time and in space clearly demonstrate the competing interests at play when it comes to this valuable natural resource. Individual chapters are devoted to an analysis of forests in central Africa, in Southeast Asia, in the Amazon and in the boreal zone respectively. Drawing on a wide and extensive range of sources, this global atlas constitutes a practical and useful reference manual and is accompanied by a video presentation. Whether it will help to stabilise and improve the state of the world’s forests remains to be seen. sadly we have to inform you that all InfoResources services will cease at the end of 2009. In the context of an internal reorientation process, our donor – the Swiss Agency for Development and Cooperation (SDC) – has decided to discontinue its financial support. Since 2003 we have been able to supply you with InfoResources News, InfoResources Focus, InfoResources Trends and the InfoResources Research Service. For us, these were interesting and challenging tasks. We hope that our services provided you with interesting and useful inputs to your daily work. Your comments are welcome; please address them to: . Jane Carter, Monika Egli, Ulla Gämperli, Alessandra Giuliani, Felix Hintermann, Fani Kakridi Enz, Andreas Kläy, Hans Schaltenbrand, Bettina Stäubli, Ruth Wenger, Susanne Wymann von Dach, and our partners CETRAD (Kenya), IC-Delegations (Andes, Bangladesh, India and Mali) and SIMAS (Nicaragua).